(Phys.org) —This new view of the Orion A star-formation cloud from ESA's Herschel space observatory shows the turbulent region of space that hugs the famous Orion Nebula. The nebula lies about 1500 light years from Earth within the 'sword of Orion' – below the three main stars that form the belt of the Orion constellation. In this view, the nebula corresponds to the brightest region in the centre of the image, where it is lit up by the Trapezium group of stars at its heart. The scene is awash with turbulent star formation, the fierce ultraviolet radiation of massive new born stars blasting away their surrounding cloudy cocoons, carving ethereal shapes into the gas and dust. 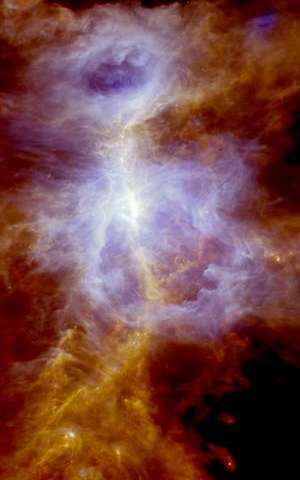 Wispy tendrils rise like flames away from some of the most intense regions of star formation, while pillars of denser material withstand the searing blaze for longer. Great arms of gas and dust extend from the Orion Nebula to form a ring, while a spine of cooler material weaves up through the scene to a halo of cloudy star-formation material above. Embedded within the red and yellow filaments are a handful of point-like sources: these are protostars, the seeds of new stars that will soon ignite and begin to flood their surrounds with intense radiation. The black regions to the top of the image and to the bottom right may seem like voids, but actually contain hints of much fainter emission that has not been emphasised in this image. The red 'islands' of emission in the bottom right are also a subtle trick of image processing for they are connected to the main cloud by much fainter emission. The bright 'eyes' in the two most distinct clouds indicates that the tip of each pillar has already collapsed and is forming stars.